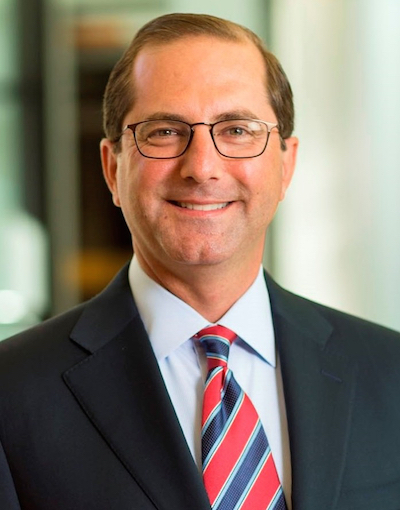 WASHINGTON — Former Eli Lilly and Co. executive Alex Azar has been confirmed by the Senate as the new secretary of the U.S. Department of Health & Human Services (HHS). Nominated for the HHS secretary post in November by President Donald Trump, Azar was approved by the Senate on Wednesday in a 55-43 vote, mainly along party lines. Azar fills the vacancy created by Tom Price, who resigned as HHS secretary on Sept. 29 amid pressure for reportedly tallying $400,000 in travel costs for chartered flights. Trump also had expressed disappointment with Price when his efforts to pass health reform legislation stalled in Congress. Sen. Chuck Grassley (R., Iowa) hailed the confirmation of Azar. “Mr. Azar is respected by both Republicans and Democrats and has been unanimously confirmed twice before by the United States Senate. His knowledge and service at the Department of Health and Human Services makes him well-qualified for this new role,” Grassley said in a statement. “I met with Mr. Azar to discuss my concerns over government transparency, responsible stewardship of taxpayer money and prescription drug prices. During our meeting, he assured me that encouraging competition in the health care and pharmaceutical industries and stemming the tide of rising drug prices would be among his top priorities,” Grassley added. Sen. Tom Carper (D., Del.) said in a statement that Azar’s support for transitioning to a health system focused on value-based care was a key reason he voted to confirm him, despite harboring concerns about some issues. “While I continue to have concerns about his perspectives on Medicaid and the Affordable Care Act, I believe Alex Azar is qualified to lead HHS,” Carper commented. “In his conversations with me, Mr. Azar said he shared one of my main goals of transforming our current health care system, which can often lead to mistreatment and overuse, to one that rewards health care providers based on the quality of care patients receive. We should reward doctors, hospitals and pharmaceutical companies for making people well, not for the number of procedures done, hospitalizations required or drugs prescribed. At the time of his nomination, Azar was chairman of Seraphim Strategies LLC, an Indianapolis-based consultancy he founded that focuses on the biopharma and health insurance industries. He served as president of Lilly USA, the largest business unit of Eli Lilly and Co., from January 2012 to January 2017. Before joining Lilly, Azar was HHS deputy secretary from 2005 to 2007 under HSS Secretary Mike Leavitt in the George W. Bush administration. He was appointed to the post after serving as HHS general secretary since 2001. Senators opposing Azar’s appointment as HHS secretary cited his criticism of the Affordable Care Act and how his ties to the pharmaceutical industry raise questions about his ability to stem rising drug prescription drug costs. “Mr. Azar doesn’t come with the staggering ethical challenges of the first Trump HHS nominee, Tom Price. And by the strict definition, Mr. Azar is qualified for this position. But here’s my view: Mr. Azar’s nomination is a perfect encapsulation of the president’s broken promises on prescription drugs and health care overall,” Sen. Ron Wyden (D., Ore.) said prior to his vote against confirming Azar. According to Sen. Elizabeth Warren (D., Mass. ), the appointment of Azar won’t mark a change of course for HHS. She said that during his confirmation hearing, Azar showed himself to be unwilling to answer questions about the accountability of large drug companies and the administration’s efforts to undermine the Affordable Care Act. “Republicans want to pretend that Alex Azar is totally different from Tom Price, because Tom Price was a terrible HHS Secretary who didn’t put the American people first. But I don’t see the difference. I see someone who doesn’t want to say it out loud, but who intends to behave exactly like Tom Price when he sits down behind Tom Price’s old desk. He will support efforts to repeal the Affordable Care Act. Gut efforts to enroll people in health insurance. Take away Medicaid from people who need it the most,” Warren commented in calling for a no vote on Azar’s nomination. “The American people deserve better. They deserve an HHS Secretary who will put them first,” she added.